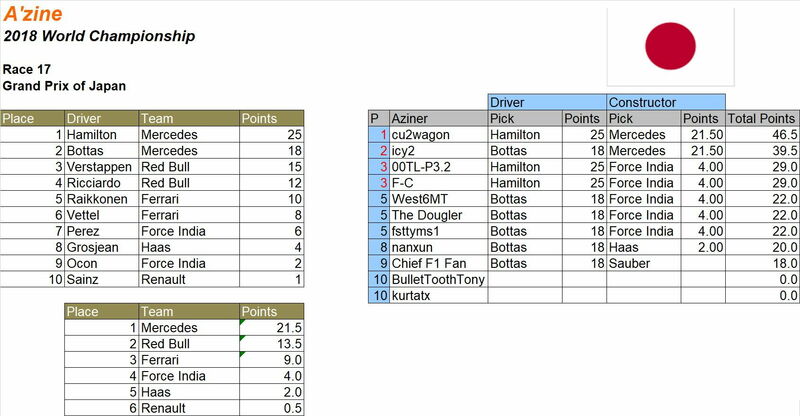 Picks close at Saturday, 2 am EST October 6th, or prior to the start of qualifying, whichever comes first. Ferrari!!!! could you screw your team leader any harder with your strategy calls??? cu2wagon achieves a rare Grand Slam late in the season. We also welcome back The Dougler, who has been MIA for the last 4 races. Last edited by F-C; 10-11-2018 at 01:57 PM.